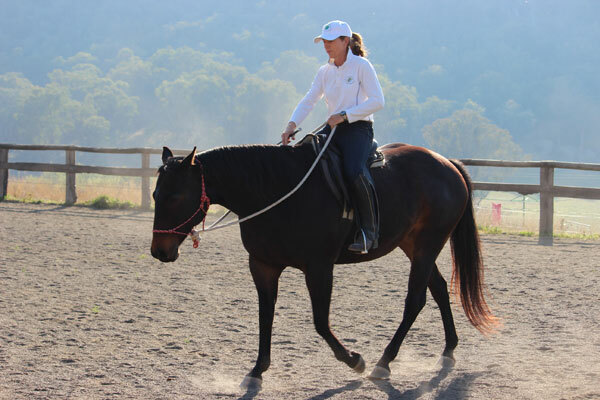 Always endeavouring to better explain and teach my learnings with horses, I have found it helpful to think about horsemanship in four different aspects. If we are having a problem with a horse or our training is not going as well as it could, considering these four aspects will help to us to find the solution. Often the solution will be a combination of two or more of these aspects as essentially they are all connected and intertwined, but it is helpful to break them down into separate parts to better understand things. I have prioritized aspect number one to the top of the list because it also greatly influences number three and four. In this sense it makes it the most important aspect, yet in many situations it is not considered at all. 1) What is my horse telling me about me (mentally, emotionally, spiritually and energetically) ? A lot of the issues that we have with horses would simply not exist if we were more at peace and congruent inside ourselves. It is the mental and emotional conflict that humans have inside themselves, caused by the emotions, thought patterns, limiting beliefs or energies they carry, that create most of the problems people have with horses. Internal unsettledness is the state that most people are living in. Some people will feel this strongly inside themselves, others will feel it lessor, while others are switched off to it completely and use “being busy” as a distraction to not feel it or acknowledge it. Anxiety and stress are two common examples that most people can relate to, but what we are talking about also extends further than this. The restrictive emotions, thought patterns, limiting beliefs or energies that we carry can emanate from past traumas and memories in this lifetime or past lifetimes, or they could be genetically inherited down through family lines. They could also be things that we pick up from the environments we are in, especially if we are working or living with people in states of distress. For example; feelings of fear, anger, grief, depression or thoughts and beliefs that we are ‘not good enough’ or ‘don’t deserve success’. These feelings or beliefs sabotage us in all aspects of our lives, not just our horsemanship. These issues are often hidden and buried deeply in our bodies and our subconscious, but our horses sense them and are affected by them. This internal unsettledness or dis-ease, of which we are often unaware, is like a radar or beacon to our horses. It can cause our horses to be resistant, defensive, brace, not go or go too much, buck, rear or not trailer load, to give just a few examples. Behavioural problems like these are often thought to occur because horses are ‘prey’ animals and humans are ‘predators’. Or they are just thought of as ‘normal’ problems to have with horses, because that is just what horses do, and it just needs to be trained out of them which often involves stressing, pressuring or drilling the horse with much repetition. I have seen many situations where no “training” techniques would work to help behaviours like the ones mentioned above but the problem behaviours were resolved very quickly when people cleared the emotions that they were carrying that were bothering the horses. Some form of force is usually what is used to resolve problems with horses but force doesn’t really solve the problems. It may override them temporarily, so it seems that it works, but issues will show up again often in another form, which could also be in the form of a physical health or soundness issue. There will also be a lack of inspiration from the horse so the horse will never be the best that they could be. Many horses and many experiences have shown me that if we truly want to have force free horsemanship, we have to look at this aspect of things. 2) What is going on for the horse mentally, emotionally, spiritually and/or energetically? The horses can be carrying their own restrictive mental, emotional or spiritual issues that can be from past traumas and memories in this lifetime or past lives. Or just like us these issues could be genetically inherited down family lines or be breed traits and patterns of thinking and feeling. 3) What is going on for the horse physically? What is causing them not to be able to do as we would like? Why can’t they physically do what we ask or perform at the level we expect? Where are they restricted in their body? This question considers all physical aspects including; saddles, equipment, diet, feet, teeth, physical injuries or accidents and general energy levels. If our horses are not healthy and high in physical energy they will not have the desire or the ability to participate in the activities that we ask them to. If they physically do not feel good, then just like us, they will not be inspired or able, to perform. The energy that I am talking about here is very different from nervous, stressed energy – running on adrenaline. Horses (and people) operating in this state often end up long term being very run down and depleted in healthy physical energy. When I take in horses for training or often with horses of my own, I might need to spend almost fifty percent of my time working on the horse’s body – soaking feet, poulticing legs and feet, massaging and energy work for example. 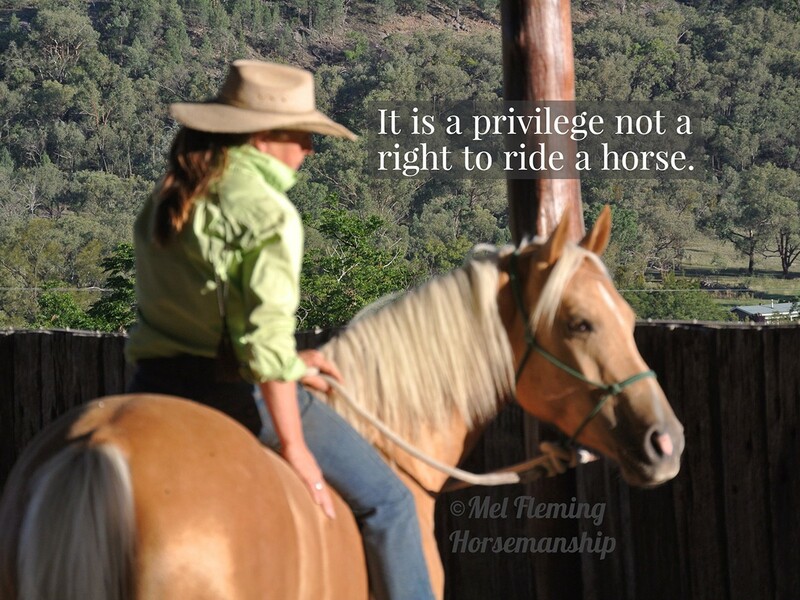 There is so much that people can learn to do themselves to help their horses. Tony Robinson teaches horse care and bodywork in our clinics because having their body in good shape is imperative. A horse that is “broken down” physically and needs rehabilitating or a horse that is being asked to do extremely strenuous work will need a lot more work on its body. Most horses are somewhat, if not a lot, “broken down” but most people don’t even know it – with a lack of energy, restrictions in their bodies and “poor posture” – meaning how soft tissue holds the bones together. A lot of things referred to as “bad conformation” are actually just postural and can be rectified. These issues are often the underlying reason when horses are classed as lazy, disrespectful, untalented or just difficult. Diet plays a big role in this physical aspect – some foods overheat horses physically and fizz them up, whilst others cause them to feel congested, stiff, restricted and lethargic. Problems may stem from injuries, stresses or traumas from being overworked. But I believe a major cause of many physical issues relates back to points one and two above. Many of a horse’s physical ailments, injuries or postural issues are related to or caused by our (or past owners, trainers, riders etc.) emotional/energetic issues, or they are the result of the horse’s own emotional/energetic issues. Internal dis-ease, if unresolved can manifest physically in many ways. It will lock up and restrict the body. The emotions that horses feel in us flow over into them. Emotions are the root cause of many physical issues. 4) How are our techniques? Do we have the physical skills, balance, correct aids and understanding of how horses should move (bio-mechanics) for the manoeuvres that we ask horses to do? Learning about how horses think and learn, how they should move and operate, and developing our physical skills – aids, communication, feel, timing and balance is very important. Horses have shown me that they want to be ridden without tension, tightness or contraction in their body or the rider’s body. There is a way of riding where we can be free, almost suspended over the horse and relatively weightless for the horse to carry – this is the state that will allow the horse to use their bodies correctly, where they will enjoy being ridden and where they can reach their fullest athletic potential. True biomechanics is based on relaxation. A state that is totally relaxed but alive and full of energy, is the state that top athletes and martial artists are operating in. This is the state that we should aspire to if we really want to enjoy riding and become great horsemen and women. Our internal state affects our ability to mentally learn techniques and the physical quality of how we implement them. Restrictive emotions or thought patterns, which could also be referred to as blockages, because they are energetic blocks and because they block us from moving forward in life, lock up our bodies and our minds. They take away our balance and prevent us from feeling and connecting to our horses. When our body is locked up we can’t flow with the horse and so will be restricting them when we ride. We will be unable to have good “feel” in our techniques – causing us to brace and tighten, which then causes the horse to brace and tighten. When we get ourselves better on the inside, the physical techniques come easily and our communication becomes clearer because we are present and focussed. We naturally have better balance, feel and timing and we are intuitively connecting to the horse more. Our bodies are more mobile, supple, balanced and co-ordinated so we can more easily learn and apply the techniques with quality. As soon as there are problems with our horses, we need to start looking at ourselves not only at the level of our physical techniques but also much deeper. It is a completely different perspective of horsemanship where we learn to listen to the horses and see what they are trying to show us. We teach people how to do this in our courses but what people can do themselves to get started is ask questions. When you identify a behaviour that is not what you want ask “Where is this in me?” “What am I afraid of?” “Where am I not going forward?” “Where am I rushing, barging through, not calm or not present?” “What emotion comes up for me when the horse exhibits the behaviour? Fear? Anger? Feeling inadequate ? Where is this in other areas of my life? What is the root cause of these emotions? The answers will not usually be directly related to the horses, but how we are in the world or ourselves in general. Meditating with your horse can help you find the answers. 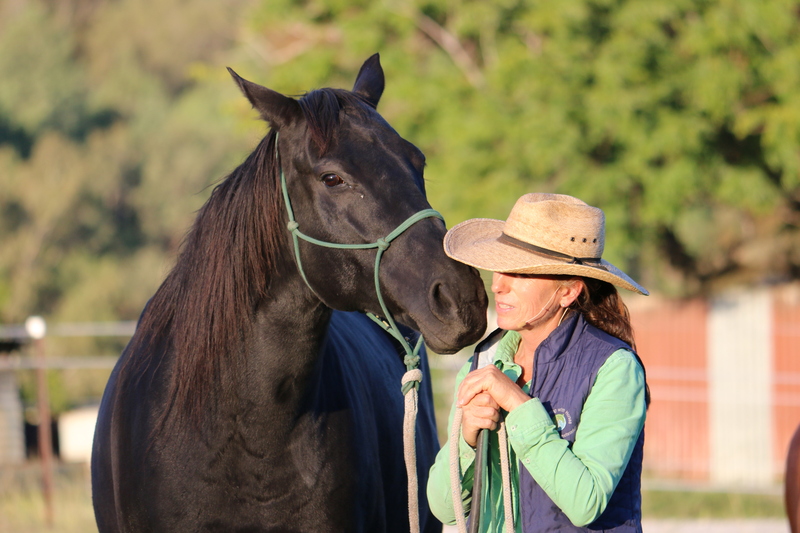 In the courses we teach techniques to help find and clear these emotions, limiting beliefs or thought patterns in yourself and your horses. Tony Robinson is also able to do distant consultations to help with this. Looking at things at this deeper level is the real key to force free horsemanship. This approach accelerates our training enormously, dramatically reducing training time and achieves results that are above and beyond any training system that I have ever come across.